This report supersedes Open-File Report 00-517. 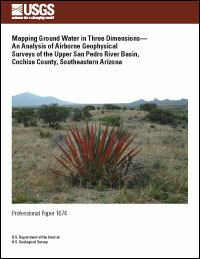 This report summarizes the results of two airborne geophysical surveys conducted in the upper San Pedro Valley of southeastern Arizona in 1997 and 1999. The combined surveys cover about 1,000 square kilometers and extend from the Huachuca Mountains on the west to the Mule Mountains and Tombstone Hills on the east and from north of the Babocomari River to near the Mexican border on the south. The surveys included the acquisition of high-resolution magnetic data, which were used to map depth to the crystalline basement rocks underlying the sediments filling the basin. The magnetic inversion results show a complex basement morphology, with sediment thickness in the center of the valley ranging from ~237 meters beneath the city of Sierra Vista to ~1,500 meters beneath Huachuca City and the Palominas area near the Mexican border. The surveys also included acquisition of 60-channel time-domain electromagnetic (EM) data. Extensive quality analyses of these data, including inversion to conductivity vs. depth (conductivity-depth-transform or CDT) profiles and comparisons with electrical well logs, show that the electrical conductor mapped represents the subsurface water-bearing sediments throughout most of the basin. In a few places (notably the mouth of Huachuca Canyon), the reported water table lies above where the electrical conductor places it. These exceptions appear to be due to a combination of outdated water-table information, significant horizontal displacement between the wells and the CDT profiles, and a subtle calibration issue with the CDT algorithm apparent only in areas of highly resistive (very dry) overburden. These occasional disparities appear in less than 5 percent of the surveyed area. Observations show, however, that wells drilled in the thick unsaturated zone along the Huachuca Mountain front eventually intersect water, at which point the water rapidly rises high into the unsaturated zone within the wellbore. This rising of water in a wellbore implies some sort of confinement below the thick unsaturated zone, a confinement that is not identified in the available literature. Occasional disparities notwithstanding, maps of the electrical conductor derived from the airborne EM system provide a synoptic view of the presence of water underlying the upper San Pedro Valley, including its three-dimensional distribution. The EM data even show faults previously only inferred from geologic mapping. The magnetic and electromagnetic data together appear to show the thickness of the sediments, the water in the saturated sediments down to a maximum of about 400 meters depth, and even places where the main ground-water body is not in direct contact with the San Pedro River. However, the geophysical data cannot reveal anything directly about hydraulic conductivity or ground-water flow. Estimating these characteristics requires new hydraulic modeling based in part on this report. One concern to reviewers of this report is the effect that clays may have on the electrical conductor mapped with the airborne geophysical system. Although the water in the basin is unusually conductive, averaging 338 microsiemens per centimeter, reasoning cited below suggests that the contribution of clays to the overall conductivity would be relatively small. Basic principles of sedimentary geology suggest that silts and clays should dominate the center of the basin, while sands and gravels would tend to dominate the margins. Although clay content may increase the amplitude of the observed electrical conductors somewhat, it will not affect the depths to the conductor derived from depth inversions. Further, fine-grained sediments generally have higher porosity and tend to lie toward a basin center, a fact in general agreement with the observed geophysical data. For more information, please contact jwynn@usgs.gov.